There’s something really special about individuals who find joy in helping others succeed. 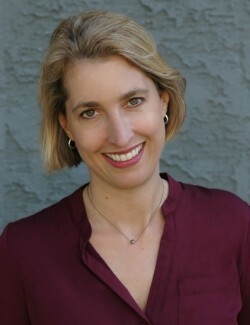 Jenny Yerrick Martin is one of those special people. What inspired you to start Your Industry Insider? I have been an entertainment hiring executive for many years. During that time, I’ve interviewed hundreds of entry level candidates and reviewed over 1000 resumes. I started Your Industry Insider because I recognized how little real-world information existed about working in the industry – what the path is for someone in a particular job – how do they get to be an agent, TV writer, film producer, studio executive, etc. – and what the day-to-day is like for someone in the job. Also, of course, best practices for getting into the industry, for moving up, and for staying in the industry. I wanted to be that person giving people the inside scoop on showbiz, hence the name of my site. The book is an extension of the content I provide on the site and in some of the free resources I create for my audience. 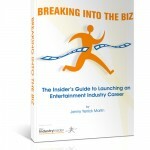 (By the way, I just released a free guide called “Identifying, Landing, and Acing Your Ideal Entertainment Internship”).The idea was to put the whole path together – formulating a career strategy with a target position, creating job hunt materials and honing other resources, and finding and landing the right opportunities. What qualities have you noticed the most successful people in the industry have in common? And what (if any) of those characteristics have been surprising? What you would expect is that the most successful people are the most hardworking, for the most part. The one that people might not expect is how nice most successful entertainment professionals, at least the ones I know, are. And I think mostly it’s genuine, especially as people get more established and start having the opportunity to “pay forward” the help they were given early on. But I also think that a key to success in the industry is recognizing the value of your human network. If you hadn’t pursued a career in entertainment, what career path do you think you might have followed instead? It’s always been about writing. I love storytelling. Over the course of my career, I have written screenplays, and novels, and now articles. I find that I enjoy telling the stories (and also reading them) of real people more and more as life goes on. The shape of someone’s life story, or an aspect of their life story, is fascinating to me. For a period of time, I did resume writing on the side. Dull, sloppy, or poorly-written resumes always kill me in my job as a hiring executive – it was very healing to be hired to create something that told a compelling and authentic career story to help someone land a particular job. Many people are surprised by how much creativity I advocate using in writing cover letters and resumes – not in falsifying your background and qualifications, but in telling them the right way to make you seem inevitable for the job you want. How important is dress/appearance in landing a job? What other factors (aside from experience/talent) are most important? Well, as I said above, you need to tell the right story so you seem inevitable for the job you seek. And once you do that on paper and get the opportunity to interview, you want to extend that story. Dress to fit into the organization’s culture. Tell stories that convey your qualifications. If you are interviewing for a production assistant job on a television show, you tell stories about how hard you have worked to get the job done, whether the job was a college project (or even something you did in high school), an internship, a volunteer experience, or even a personal experience where the odds were against you and you made something happen or got something done. A recent example of this type of demonstrating you are right for the job was in the profile I ran of former agent talent Jill Cutler. She wanted to work at Creative Artists Agency (CAA), the top agency in Los Angeles, but when she called the HR director, she was curtly told they didn’t have any openings. “I had bought a book about getting a job in Hollywood and it said that even if a company is not hiring, you should just call them every single week until they agree to sit down and meet with you, even if it is just an informational meeting,” she explained “I submitted my resume to a woman at CAA by the name of Arlene Newman and called literally every Wednesday for three months until she agreed to meet with me.” This perseverance, a steadfast failure to be deterred in reaching her goal, demonstrated one of the key qualities required of an agent. It’s no wonder she was hired soon after the HR director relented, and then promoted up the chain to agent eventually. How have the people you’ve profiled on YII helped you in your own career? It’s helpful in building my body of knowledge about the industry to have more and more profiles. A great example is that story about Jill Cutler, which is so helpful in illustrating a key point to my readers and the people I speak to at colleges and other events. Aside from my ongoing corporate position, Your Industry Insider is my career so I am not looking to get my scripts read or land auditions or another position. Has maintaining a career in the “biz” ever interfered with having a normal family life? This kind of speaks to the above question about my career. I have been a writer my whole career, mostly on the side. I have had interest in my screenplays and have been represented for both screenplays and novels, but I have made my living through my corporate position and done a variety of creative pursuits, including writing, on the side. There was a point where I was pursuing television writing. I was finding that I had skill in creating in that format and I had enough contacts that I would probably have been able to get myself staffed eventually and start moving up that way. But at the same time I was coming to these realizations, my husband and I were in the process of adopting a baby. And I realized that if I was successful with TV writing, I would see the writing staff on whatever TV show I was working on more than I would see my husband and this child I was finally going to have. So instead of pursuing something that would demand so much time and attention outside the home as a full-time career path, I decided to stay on my existing path and create something of my own on the side. I can work on it off-hours, on my own, and still be front and center in my family life. It’s not a decision everyone would make but it works for me. Do you teach or have you ever spoken at an industry panel or event? I do speak to college and other industry groups, both as a keynote and part of a panel. I haven’t had time to teach an ongoing class, but I am in the process of creating a couple of online courses on industry topics. In addition, a partner and I are putting together an all day event in the fall for people who have recently moved to Los Angeles to enter the industry. You’ve given great guidance on how to break into the industry in your book, but what advice could you give to someone on how to stay in the industry (and have a lasting career)? From the very beginning of your career, you must remember that you are not just creating a career or trying to reach a goal. You are joining a community and having a life. Seek always to contribute to the community as a whole and help the other members of the community. In that way, you will always be a valuable and valued member of the industry.